A BELFAST music and dance group is doing its bit to symbolise the new future of relationships in the north. 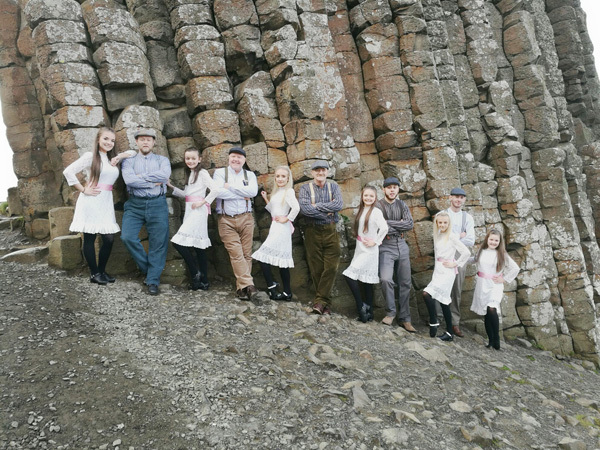 Formed in summer 2015, the Hounds of Ulster musicians and the McCullough/Curran school of Irish dancing collaborated to create a specially choreographed short Irish dance to music performed by known as Hounds Music. Since these humble beginnings this relationship has developed into a larger and more mature performance coming to symbolise the new future of relationships here. Their work has taken them to Strasbourg for a performance to MEPs at the European Parliament and Fleadh Cheoil na hÉireann last year. Earlier this week, the group performed in the Great Hall at Stormont Buildings, showcasing a new cross-community music and dance performance. Founder Dee Crooks explained the uniqueness behind the music and dance of the Hounds Music. “We are unique in our music and dance. We are trying to bring communities together,” he said. “Having its roots in the marching band and Irish dancing cultures our group presents a fresh spotlight on how our communities and their relationships have changed in recent years. “Performing at events at the European Parliament and in North America have also served to promote both our communities and Northern Ireland in a positive and progressive light. “Together the people and representatives can create a community that will help develop good relations along with diversity and positive vision for us all. The new cross-community group was formed from the Hounds of Ulster flute music group, who played a mixture of traditional Irish, Scottish and Ulster-Scots songs. Musicians in the group include the multiple award winning highland piper Graham Harris. “We have various styles of drums and percussion to create a sound that is unique to ourselves but also connects the cultures here in Northern Ireland,” said Graham. “To move forward with the times we wanted to use the past to do so. Northern Ireland has many great stories to tell and a strong history that needs to be remembered and promoted in the best possible way. “We feel that music is a language for all to use and a medium platform to showcase our talents that don’t get seen outside the streets of Northern Ireland. Dee added that having dancers on board from the McCullough Curran School of Irish Dance enhanced the group’s performances. The ethos of inclusive participation is maintained across the group’s membership, with the ethos being ‘Music Unites’ and the mission statement being romoting Culture in a Different way, an alternative approach and in a tolerant, diverse and engaging manor for an inclusive and positive outcome.